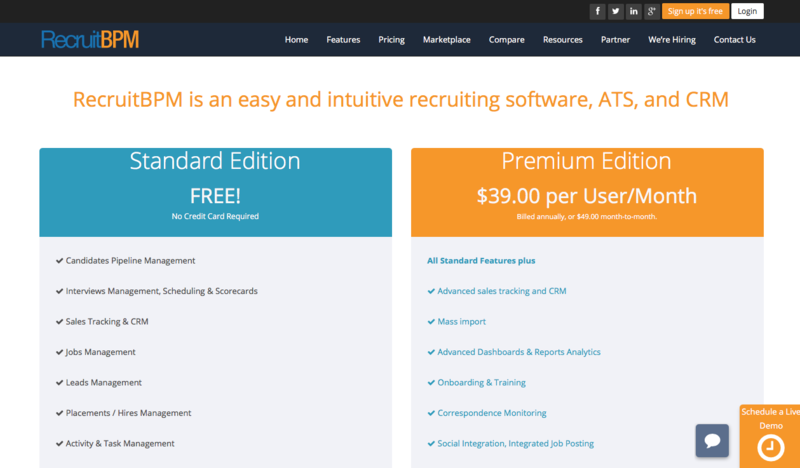 RecruitBPM’s Standard Edition is free for everyone. The Premium, features-packed version is also offered for a free trial for 30 days with no sign-up charges. If you want to go for a month-to-month subscription it will cost you only $49.00. For annual subscription with RecruitBPM, you will have to pay only $39.00 per month. There are no hidden fees, and there never will be. If there is a 3rd-Party product that you’d like us to integrate with, there may be additional fees depending on how much it costs to partner with that product. Any and all fees will be discussed and agreed upon before any action is taken, and your organization will always be alerted of potential extra costs well in advance. We will never charge you for something that you have not agreed to pay for. * RecruitBPM reserves the right to change the pricing policy at any time.